Elearning! December 2016 / January 2017 25 timelines for enterprise-wide HRMS environments were not uncommon for organizations, especially when these solutions were implemented alongside other enterprise-wide solutions. In the last few years, we have seen a decrease in overall implementation timelines, particularly for licensed environments, but also for Cloud/SaaS solutions. Less customization, greater access to APIs, and pre-developed connectors for integration, along with more adequately trained implementation partners, have all led to a reduction in overall implementation timelines over the past three years. At this point, there are fewer on- premise implementations than Cloud/ SaaS implementations, since very few organizations are aggressively selling their on-premise solutions. LEARNING APPLICATIONS Because of complex learning needs, large and medium organizations are much more likely to have high levels of learning application adoption over small organizations. Sierra-Cedar anticipates continued shake up in the learning space over the next few years as enterprise soware packages continue to invest in their new learning solutions, and many niche learning players coming out of the consumer learning space (like Degreed) are trying the change the concept of who owns an employee's learning record. Although Cornerstone OnDemand focuses heavily on its talent management modules, it continues to be one of the largest providers in the learning space and holds the highest level of application adoption at 19 percent; for large and medium organizations, Cornerstone OnDemand sees an increase forecasted adoption in the next 12 months. Other companies that are expected to grow substantially are SuccessFactors Employee Central, Saba, Health Stream, Oracle HCM Cloud (which is being rolled out separately from the Oracle Taleo/Learn solutions). Moderate growth is likely to come to NetDimensions and SilkRoad. SumTotal and Skillso — now combined organizations — continue to hold large adoption shares in learning across all organization sizes. It is likely that many organizations use Skillso as a secondary learning solution along with their primary learning management system (LMS), but decreases are projected in adoption rates for this vendor for both applications. —Research for Sierra-Cedar conducted by Stacey Harris, vice president of Research & Analytics and research consultant Erin Spencer. 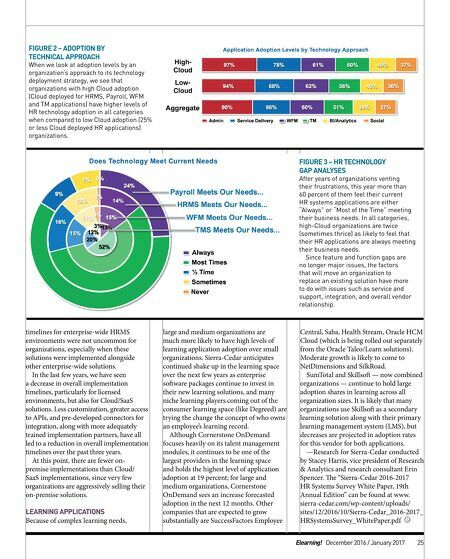 e "Sierra-Cedar 2016-2017 HR Systems Survey White Paper, 19th Annual Edition" can be found at www. sierra-cedar.com/wp-content/uploads/ sites/12/2016/10/Sierra-Cedar_2016-2017_ HRSystemsSurvey_WhitePaper.pdf FIGURE 2 – ADOPTION BY TECHNICAL APPROACH When we look at adoption levels by an organization's approach to its technology deployment strategy, we see that organizations with high Cloud adoption (Cloud deployed for HRMS, Payroll, WFM and TM applications) have higher levels of HR technology adoption in all categories when compared to low Cloud adoption (25% or less Cloud deployed HR applications) organizations. 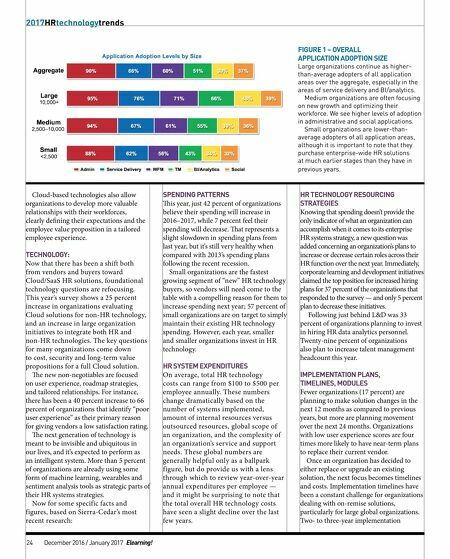 FIGURE 3 – HR TECHNOLOGY GAP ANALYSES After years of organizations venting their frustrations, this year more than 60 percent of them feel their current HR systems applications are either "Always" or "Most of the Time" meeting their business needs. In all categories, high-Cloud organizations are twice (sometimes thrice) as likely to feel that their HR applications are always meeting their business needs. Since feature and function gaps are no longer major issues, the factors that will move an organization to replace an existing solution have more to do with issues such as service and support, integration, and overall vendor relationship.